Sleep Apnoea Causes & Symptoms | What is Sleep Apnoea? Sleep apnoea is a dangerous sleep disorder characterized by frequent cessation of breathing during sleep. In some people, this can occur more than 100 times a night and last as long as one minute. Partners may notice patterns of loud snoring during the night followed by periods of silence and stopped breathing. In some instances, sufferers’ snoring may cause them to wake on their own, or become roused from sleep gasping for air. First, it is important to understand that there are two kinds of sleep apnoea: obstructive sleep apnoea and central sleep apnoea. Obstructive sleep apnoea happens when the throat muscles relax during sleep. For back sleepers, the tongue relaxes against the back of the throat and narrows the opening through which air passes, limiting or altogether restricting air from getting through. This causes vibrations in the airway resulting in the sound we know as snoring. The brain responds to the lack of air by waking the sleeper momentarily, but upon falling back asleep the process repeats itself. This constant sleeping and awakening cycle prevents entering and fully experiencing the various phases of sleep, which can result in feeling tired during the day. Central sleep apnoea is more complicated and occurs when the brain doesn’t transmit the signal to breathe. Typically people who experience this kind of sleep apnoea have previously experienced other problems such as stroke, brain injuries and heart disease. One of the most noticeable symptoms of sleep apnoea is loud snoring during the night, often loud enough to wake your partner or even the snorer. However, not all sleep apnoea sufferers snore and not all people who snore have sleep apnoea. There are several risk factors that may influence obstructive sleep apnoea such as excess weight, sleeping on one’s back and alcohol or sedative use before sleep. All of these factors can cause the throat muscles to relax or the tongue to collapse against the back of the throat, resulting in snoring and obstructed airways. Exercising a healthy lifestyle that promotes weight management and limited alcohol intake may assist in resolving sleep apnoea. 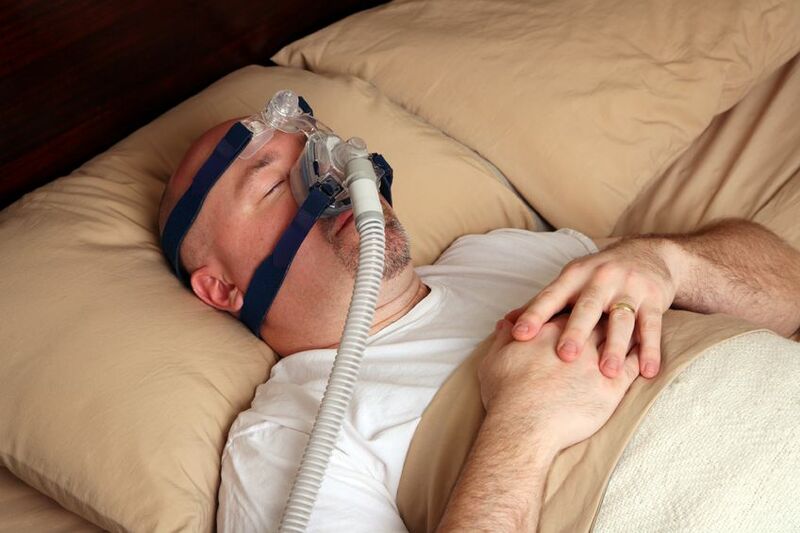 For those whose sleep apnoea is a bit more complex, the use of a CPAP device can help keep users breathing at night. CPAP, or continuous positive airway pressure, devices pump air into the user’s throat, providing a regular airflow and preventing the airway from collapsing. Sometimes the CPAP device can be noisy and the required face mask may be irritating. Provent Sleep Apnoea Therapy has proven to be an effective, mask-free sleep apnoea treatment. Users place the disposable device over their nostrils before bed, and its MicroValve technology uses pressure from your own breath to keep your airway open. Provent is also ideal for use during travel. For those whose sleep apnoea is caused by sleep position, Night Shift is a non-invasive device that guards against sleeping on the back. Worn around the neck, Night Shift emits a subtle vibration when it senses the wearer rolling onto his or her back. If you think you may be suffering from sleep apnoea, talk to your doctor about getting full evaluation and formal diagnosis today.